For other uses, see The Music Lesson (disambiguation). The picture was sold in May 1696 in Delft, part of the collection of Jacob Dissous, which included many Vermeers. It was later acquired by Venetian artist Giovanni Antonio Pellegrini in 1718, with Pellegrini’s collection later being bought by Joseph Smith. The Music Lesson has been part of the Royal Collection of Great Britain since 1762, when King George III bought Smith's collection of paintings. When the painting was acquired it was believed to be a work by Frans van Mieris the elder because of a misinterpretation of the signature. It was not correctly attributed to Vermeer until 1866 by Théophile Thoré, though some scholars were skeptical whether it was Vermeer or not. It has at various times been kept at both Buckingham Palace and Windsor Castle, and is depicted in Charles Wild's Windsor Castle: the King's Closet, 1816, a watercolour prepared for William Pyne's History of the Royal Residences. 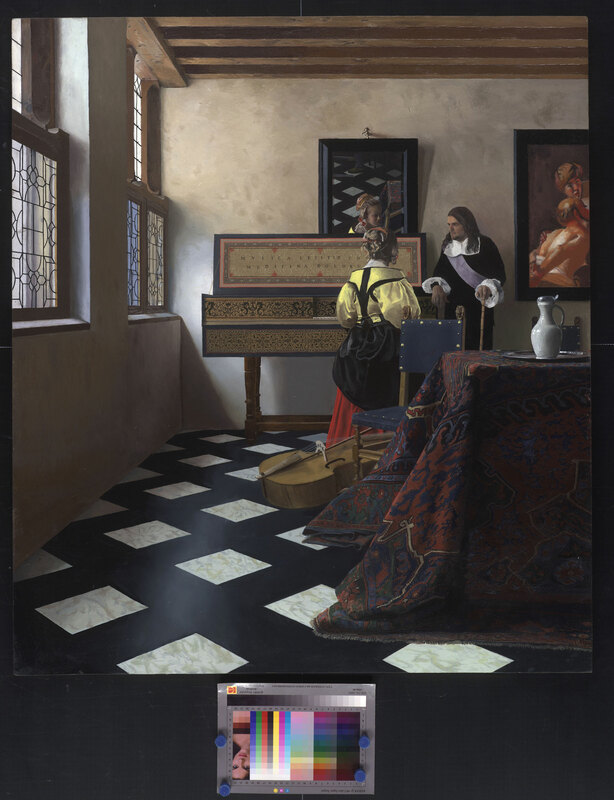 The painting was investigated by Hermann Kühn in 1968 and there is also material on the pigment analysis on the website of the National Gallery in London where the painting was included in the exhibition "Vermeer and Music: The Art of Love and Leisure" in 2013. 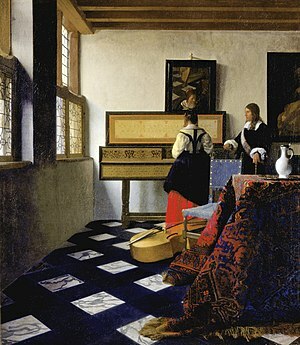 The Music Lesson is a mature work of Vermeer and his handling of color and his choice of painting materials is but one of the aspects proving his mastery. The painting is dominated by dark areas such as the bluish-black floor painted in bone black with the addition of natural ultramarine. The 2013 documentary film Tim's Vermeer documents inventor and entrepreneur Tim Jenison's attempt to recreate The Music Lesson to test his theory that Vermeer painted with the help of optical devices. Jenison is given the opportunity for a brief private viewing of the painting at Buckingham Palace. The film's claim that Vermeer used something similar to Jenison's technique has been derided by art critics Jonathan Jones and Bendor Grosvenor. ^ "Explore the Royal Collection Online". www.rct.uk. Retrieved 2018-11-08. ^ a b "The Royal Collection". The Royal Collection. Archived from the original on 2011-06-09. Retrieved 2013-12-24. ^ White, Christopher (1982). The Pictures in the Collection of her Majesty the Queen: the Dutch Pictures. Cambridge University Press. ISBN 0-521-24283-5. ^ "Windsor Castle: the King's Closet, 1816". Retrieved 2017-02-11. ^ Andersen, Kurt (November 29, 2013). "Reverse-Engineering a Genius (Has a Vermeer Mystery Been Solved?)". Vanity Fair. Wikimedia Commons has media related to The Music Lesson (Vermeer). This page was last edited on 7 December 2018, at 19:42 (UTC).